Being a couple of years on from the last CD (aka 2013’s ‘Uniform Wall’ – also released on Secrets of Giza – reviewed here), Illuminoscillate have now returned with a new offering. Although remaining within an expansive dark ambient framework, ‘Illicit Religion’ has taken a step away from the mechanized throb and rhythmic churn of ‘Uniform Wall’ by opting for a droning and flowing approach. 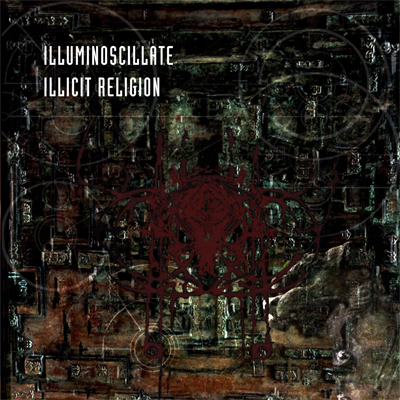 Thematically speaking ‘Illicit Religion’ is said to deal with both the conscious and unconscious mind, whilst the 7 tracks/ 47 minutes form an interlinking whole (as with much dark ambient fare). Although spanning seven and a half minute, the opener ‘Subliminal’ feels to be an extended intro piece, but does draw the listener in with a slow swirling mass of atonal layered drones. With this track acting as a gradual sonic descent, it leads into ‘Anonomunity’, which contains a fragment of a looped melody which hauntingly weaves through the ritualistic dronescape and in the process cements a meditative and esoteric tinged sound. A mysterious and spiritual aura is then embedded within ‘Invocation – Sugito Town’, which is both distant and forlorn in feel. Here the evocative scraping metallic textures (contact mic on sheet metal?) and ritualistic chimes gives rise to a compassion with late era raison d’etre – albeit here it features an Asiatic spiritual tone. ‘Father of the Flame’ sits as the album’s centrepiece, with it esoteric ebbing and flowing atmospherics and sporadic use of an emotive female Japanese voice for added effect (courtesy of K.Saito). ‘Beneath Swollen Sands’ ratchets up the tension with static riddled drones and although far from being harsh is a forceful composition – a veritable downward spiraling black hole vortex. Gradually shifting into ‘Blind Flight’, it reveals a track of shimmering, widescreen, barren wasteland ambience where a sparse barely detectable guitar and synth melody flirts within the background. The final album offering ‘Resignation’ is then one of the shorter album pieces and the most sonically direct with rough pounding static forcefully grinding drones. Although being paired back and minimalistic when compared to its predecessor, ‘Illicit Religion’ has still captured a sound and tone that blends the organic (field recordings, voices, etc.) and the synthetic (drones, multi-layered sonic treatments etc.) and consequently achieves an engaging and enveloping album. It is also another seemingly an effortless display of abstracted but sonically engaging dark ambience from this rather critically under-appreciated project. An album worthy of your attention. This entry was posted in 2016, dark ambient, Secrets of Giza by noisereceptor. Bookmark the permalink. Agree – sparser and more minimal than Casey’s last album but just as good.